Barbara June Burton Dake, daughter of Russell Moore Burton and Willie Herndon Foster, married to Fredrick Roy Dake and buried in Azleland Memorial Park Cemetery, Reno, Parker County, Texas. AZLE -- Barbara June Dake, 81, passed away Saturday, Sept. 3, 2011, in Granbury. Funeral: 10 a.m. Wednesday in White's Funeral Chapel, 105 Denver Trail, Azle. Interment: Azleland Memorial Park. Visitation: 6 to 8 p.m. Tuesday at the funeral home. Barbara June Dake was born June 6, 1930, in Winters, daughter of the late Russell Moore and Willie Foster Burton. She married Roy Dake in 1950, in Wheeler, and they began their life together. June was a member of The Gideons International and participated in prison ministries. She was a prolific published writer. June had a servant's heart and was very good at helping those that were less fortunate as well as volunteering her time with a hospice group. She also taught Sunday school and was a member of Walnut Creek Baptist Church. 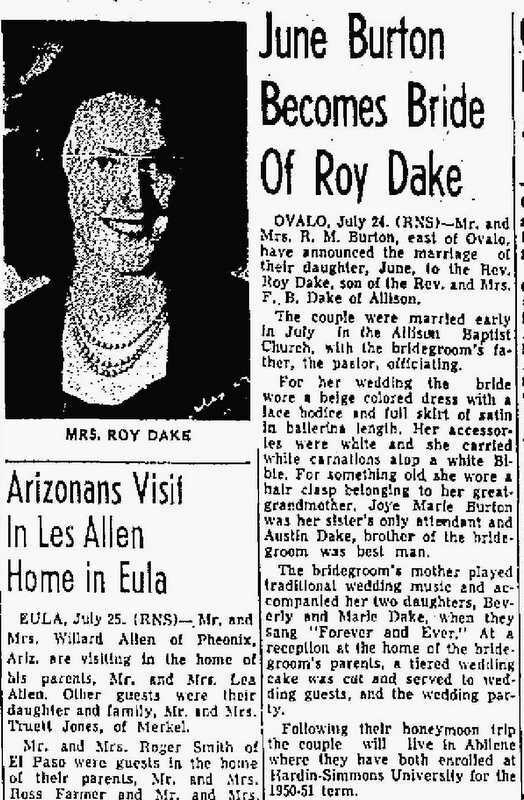 June was preceded in death by her husband, Roy Dake; a grandson, Joel Williams; a sister, Geraldine Barbee; and her parents. Survivors: Children, Barbara Ramons and husband, Raymond, Steven Roy Dake and wife, Valerie Ann, of Arlington, John Dake of Lake Worth, and Debby Williams and husband, Jeff, of New Zealand; 13 grandchildren; 11 great-grandchildren; siblings, Joy Horton, Martin Burton, Linda Wolfe, and Brenda Erwin; numerous nieces and nephews; and a host of loving family and friends.